So who actually enjoys pulling pranks on April 1? Sociopaths, said Oliver. He proved this by providing what sounds like a perfectly reasonable explanation for the holiday to his viewers, then yanking the carpet out from under them. “I want you to sit in that terrible feeling for a moment,” he said. “You may be laughing on the outside, but on the inside, admit it, you were sad.” That, the comedian explained, is what’s so awful about April Fools’ Day. It’s a holiday built on lies and hurt feelings. 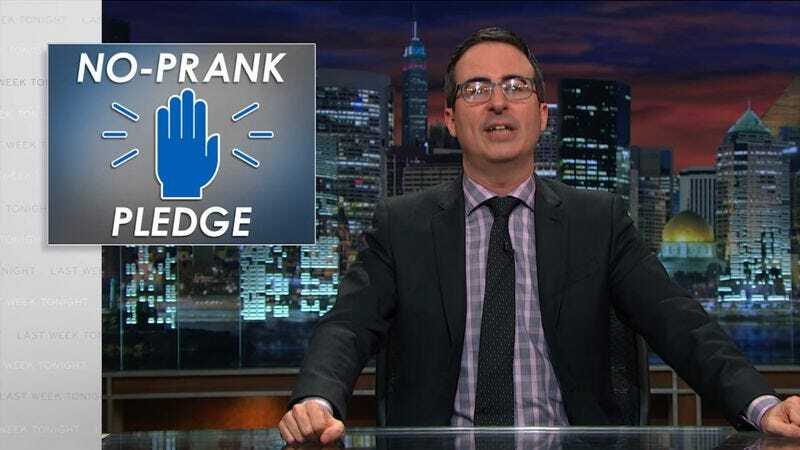 To combat this, Oliver made his audience (and, presumably, those watching on the internet) take a “No Prank Pledge” in which they promised, again and again, not to be dicks. A year later, it is time to renew that pledge.